There are many different materials you can use to upgrade your backyard, from visually engaging patio pavers and stepping stones to clean and minimal concrete or gravel. Making the right choice affects more than the overall look of your yard. It affects its comfort, how you can use it, its resistance to extreme temperatures, and so much more. Professional patio paving companies give their clients a wide number of choices for their properties because they know that the various materials available have a plethora of different benefits and prices. 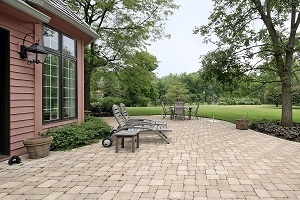 Choosing the right outdoor pavers in Alpharetta means being able to enjoy a practical and beautiful outdoor environment for many years without repairs or replacement. To help you consider the options and be an informed shopper, patio installation professionals have complied a list of the different materials you can have installed in your yard and important details about each of them. Bricks are classic materials that are easily recognizable and suit a wide variety of architectural styles. They are made in an assortment of colors and finishes, and they can also be painted virtually any color you want. White painted brick, for example, is now very fashionable and is a foundation of good patio design. The bricks can be arranged in various patterns for different effects. Be aware that brick flooring tends to be uneven because of the grout or mortar between them. Concrete is durable and simple, and it can be finished in a variety of styles. However, concrete is not resistant to water and can crack easily. This is a good option for those looking for a simple and clean flooring option. For a more durable and attractive option, consider concrete patio pavers, imitation stones that are stronger than brick. They are also easy to install; simply lock them in place and you're done. 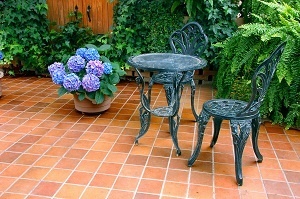 Concrete patio pavers are inexpensive and engineered to last a long time. Natural stone is beautifully rustic and charming. It can elevate any outdoor space to look elegant and soothing. It has natural variety in coloring and patterning, and it can be cut into neat tiles or rugged boulders. While stone is extremely beautiful and long-lasting, and can last for centuries without breaking down, it tends to be far more expensive than other paving materials. Compacted gravel is a cheap and simple material that resembles tiny pebbles that are fitted into a bordered area to make a patio. It can be uneven and requires occasional smoothing in order to look its best. Unfortunately, gravel tends to travel. The pebbles can be carried away in your shoes or kicked out of place, making them messy. With good upkeep and occasional refilling, though, this is a cheap and classy option for your outdoor spaces. These smooth and low-maintenance tiles can be installed simply and easily. They can be made from a variety of materials, but they are essentially similar. They can resemble indoor ceramic tile or even natural stone. They add a touch of the indoors to outdoor spaces, which is great for comfortable outdoor dining and entertaining. However, they can crack under too much pressure. Also called timber, wooden outdoor flooring is easy to install, has a natural appearance, and is finished for weather and sunlight resistance. While wooden decking is often associated with a rustic or cabin-like appearance, it can be modernized with beautiful finishes. There are wood alternatives available that are slightly more durable, but they have less natural variation and beauty than real wood. Try to avoid installing natural wood on patios that get full sun for several hours a day. If you want your very own beautiful paver patio, one that is cost-effective and built to last for several years, find a reliable and experienced hardscaping company that installs pavers in Alpharetta. You can have the patio, deck, walkways, fire pit, etc., you have always wanted. One or more of the materials above can help you achieve your landscaping design dreams.